Coju™ for Outlook - Download and installation. 1. Click here to download Coju™ for Outlook. 2. After downloading, install the program in your computer then launch the application. 4. Press the 'Copy to Clipboard' to copy License ID (highlighted in yellow) in the clipboard. 5. Goto the license website by clicking on the link in license window or click here. License is only required if you need to select more contacts than provided in FREE version. 7. Carefully copy/paste the License Key in the License Key field of the license window (highlighted in yellow). 8. 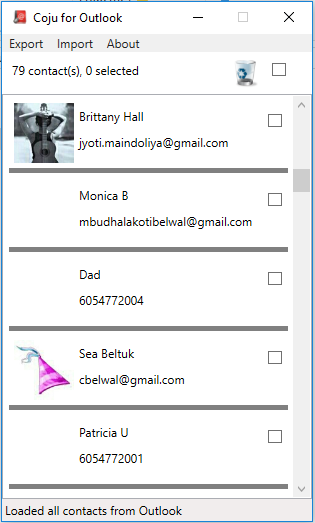 Press the 'Save&Close' button, Coju™ for Outlook will now work in paid mode and 'FREE' in the title bar will be done. 9. If you still see 'FREE'in the title bar the License Key entered was invalid. Please copy/paste the License Key again making sure no extra characters are copied.